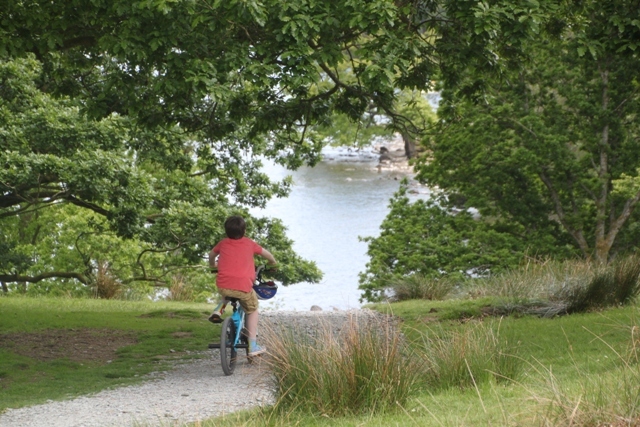 One sunny, summer afternoon we packed up our bikes and headed for the Lake District. 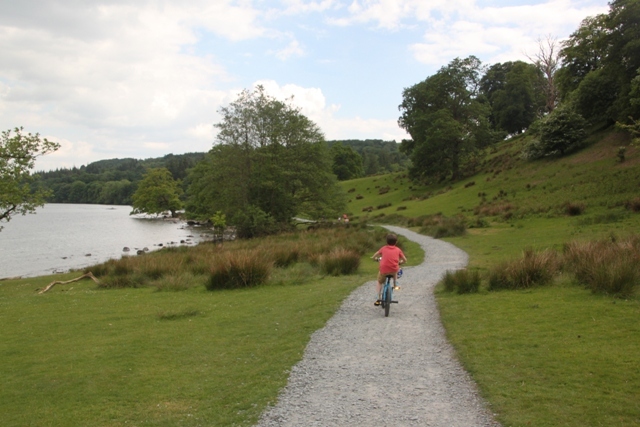 An afternoon of cycling along the shores of Lake Windermere, England’s largest natural lake and site of great beauty was the plan. Exercise and great views were our inspiration, plus husband was desperate to try out our brand spanking new bike rack. An easy drive to the lakes with empty roads, everybody else must have stayed at home to sunbathe. We turned off the motorway and I had a wow moment. 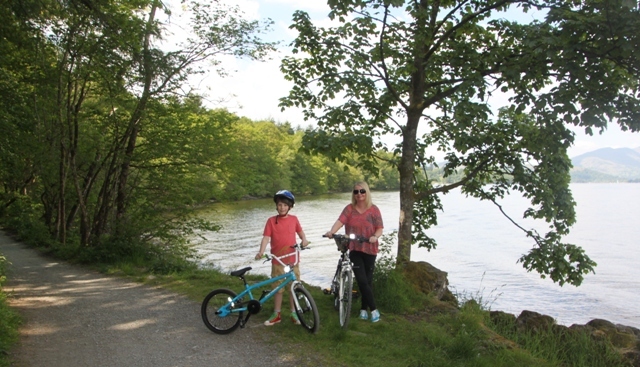 One minute we were on the busy, featureless M6, the next we were hit by the full beauty of the lakes – blue skies, sun, craggy mountains and glistening water. It was instant and spectacular. Having recovered from my swoon, I commented to husband that we should come here more often. But it always rains, was his reply. The weather is notoriously unpredictable, but today we had hit the jackpot. 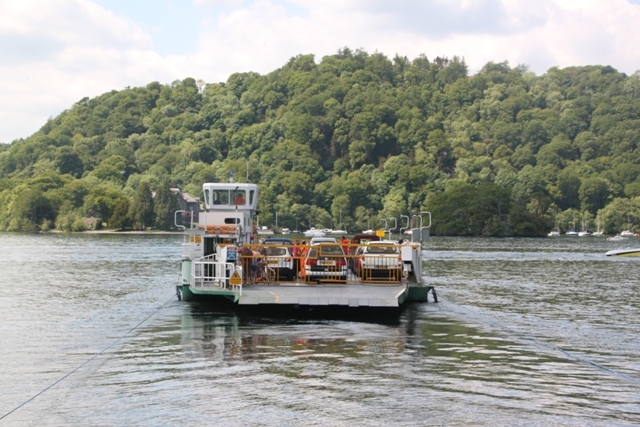 We took the car ferry across the lake to avoid a lengthy drive around the shores to get to our cycle start point. The ferry is tiny and only holds about 10 cars. We just missed one, but it ventures back and forth across the lake all day, so 20 minutes later we were on board. The car park at Harrow Slack was easy to find, we unhooked the bikes, got helmeted up and set off. 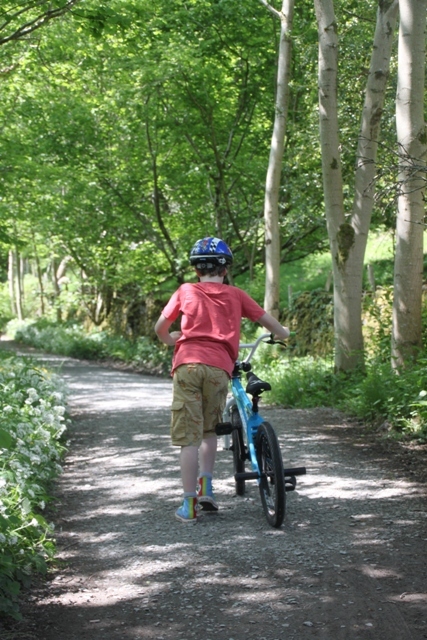 The route was billed as 10 miles of traffic free bridleways, a bit of a shock when the 9 year old raced off and came face to face with a car. The traffic free part kicked in a little further along. We passed open fields and lots of people picnicking at the lake side. I read somewhere that the Lake District is “Italian lakes and Norwegian fjords packed into a 35 mile chunk of England.” That sounded about right. It is not hard to see why this landscape inspired many a romantic poet (Wordsworth et al). The cycle track moved from the edge of the lake into woodland. It was stony, loose, bumpy and mighty uncomfortable but the views took our mind off the pain. We seemed to have left everyone else behind and enjoyed the solitude and glimpses of the glistening lake through the trees. Lots of stops were essential for many photos. That and the fact the path was undulating to say the least – many steep, short ascents but on the plus side speedy, fun descents. Going down was a breeze, going up, not so easy. The 9 year old and I frequently admitted defeat and dismounted for the hills. The whole cycle route was about 10 miles, we made it last all day. The 9 year old fell off his bike in spectacular fashion on one of the aforementioned descents and then fell out with the bike in spectacular fashion. 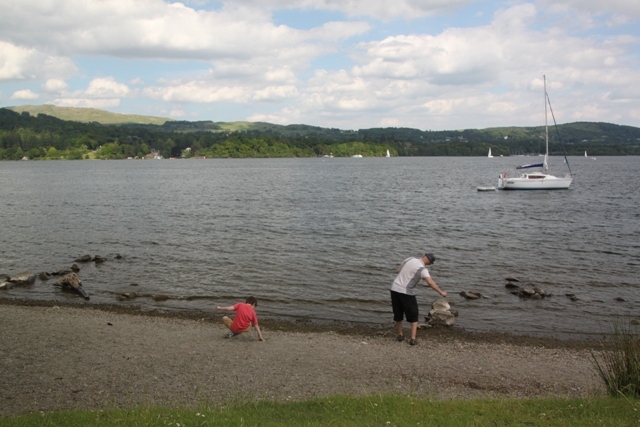 A game of skimming stones on the lake soothed the pain and improved the situation. 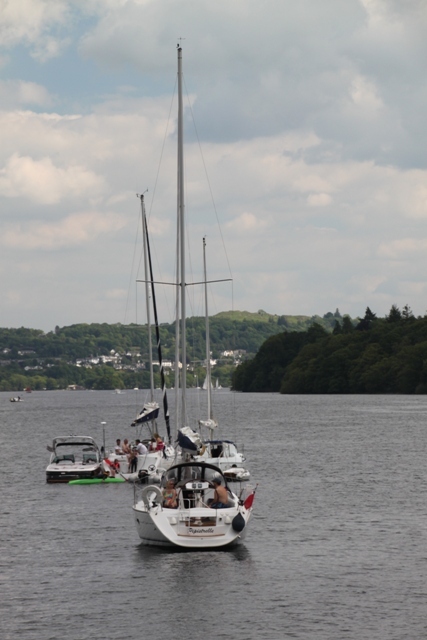 Lake Windermere is so beautiful, cycling was the perfect way to explore its shores. The finest scenery, the greenest countryside and the grandest views – a perfect summer day out. Absolutely love the photos! I’m studying in Lancaster right now and still haven’t had a chance to visit Lake Windermere. Looks like a lot of fun. Thank you. You should definitely go when you get the chance. It is gorgeous there. Slowly getting through a couple of your journeys. I also love these pictures! It looks ideal if you can hit the right weather! Thank you – yes, if you get the sun it’s wonderful. Also enjoying your Bangalore photos – it looks amazing there. This is just the kind of adventure I love! We’ll be traveling to England from the US this summer or the next so it’s good to start collecting ideas of things to do. Thanks! It’s beautiful and a great place to spend some time. Hope you enjoy planning your trip!